LOS ANGELES, California (CNN) -- A previously unreleased video of Michael Jackson's hair catching fire while filming a Pepsi commercial in 1984 was posted online by Us magazine Wednesday. Michael Jackson, shown here in the mid-'80s, was involved in a accident while filming a commercial. The onstage mishap 25 years ago, in which Jackson's scalp was burned, has been blamed for leading the entertainer to prescription pain medications. A publicist for Us magazine said the publication would not comment on how the video was obtained. The dramatic footage shows pyrotechnics exploding near Jackson and yellow flames immediately erupting on his black hair. The pop star continues to dance down stairs for about 10 seconds before stage hands rush to him to douse the fire that has covered his scalp. Miko Brando, son of actor Marlon Brando and Jackson's close friend, was the first person seen reaching Jackson. The video -- posted at usmagazine.com -- also shows early takes of the commercial in which the fireworks were triggered several seconds after Jackson began dancing down the stairs, putting him well away from the blasts. The commercial was filmed in Los Angeles' Shrine Auditorium before a live audience on January 27, 1984. It was part of Jackson's groundbreaking Pepsi sponsorship, near the height of his popularity. "As you may already know, after my tour ended I remained outside the country undergoing treatment for a dependency on pain medication. This medication was initially prescribed for the excruciating pain that I was suffering after recent reconstructive surgery on my scalp." The story in Us magazine's weekly print edition is titled "The Day His Addiction Started." 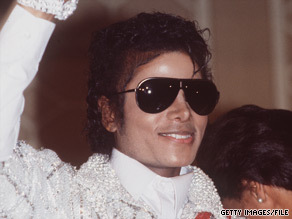 Jackson appeared at the Grammy Awards just six weeks later, wearing a hairpiece, to collect eight Grammys. His Pepsi commercial also aired for the first time during that Grammy broadcast.